Cook couscous in water as directed on package. Cool uncovered for 20 minutes. In large bowl, combine all remaining salad ingredients. Add cooked couscous; toss gently to mix. In small jar with tight-fitting lid, combine all dressing ingredients; shake well. Pour dressing over salad; toss gently. Cover; refrigerate 1 to 2 hours to blend flavors. Heat oven to 425°F. Line shallow baking pan with foil; spray foil with nonstick cooking spray. In small bowl, combine honey, mustard, 1/4 teaspoon salt and 1/4 teaspoon pepper; blend well. Place chicken breast halves in sprayed foil-lined pan. Spread chicken with half of honey-mustard mixture. Bake at 425°F. for 20 to 25 minutes or until chicken is fork-tender and juices run clear. To serve, arrange salad on individual serving plates. 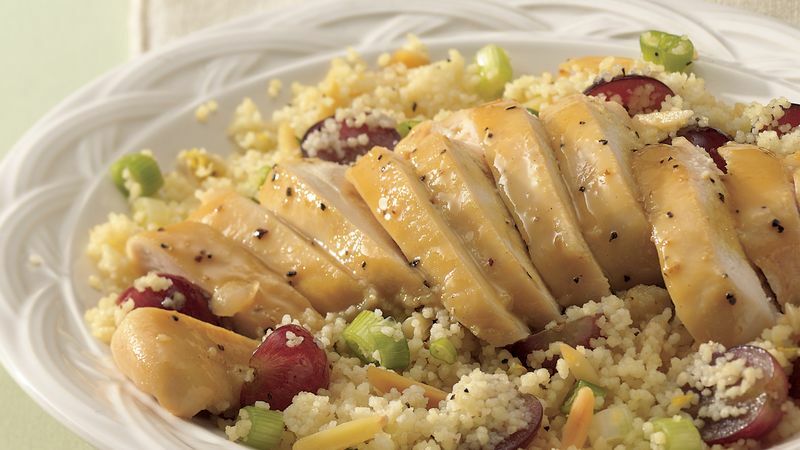 Cut chicken crosswise into slices; arrange on top of salads. Drizzle remaining honey-mustard mixture over chicken. Salad, dressing and chicken can be prepared ahead of time and assembled just before serving. It is important when spreading the honey mustard over the chicken that you don't contaminate the honey mustard you're reserving for later with anything that touched the raw chicken.